Coupon/Offer Details: Shop at Jaxtakart and get flat 25% off across the site and extra 10% as a part of the sale. Use the given Jaxtakart promo code and get the discount. Hurry up! Coupon/Offer Details: Jeststay independenceday offer , avail upto Rs 500 off on all domestic flights. Use the given Jetstay independence day promo code to avail the discount. Minimum booking value of Rs 3000 is required to avail this discount. Hurry up and book today. Jeststay offers Flat Rs 1000 OFF on all domestic flights. Use the given Jetstay coupon code to avail this flat discount. Code applicable to a minimum booking value of Rs 7000. Offer applicable only domestic flight booking. Independence Day is almost here and so are the offers and deals! Make this 15th August 2019.a memorable one by availing awesome Independence Day offers on fashion, travel, home décor and more. Get whopping deals and exciting discounts on a wide range of clothing, accessories, home decor, flight bookings and amazing offers on your favorite brands. Check out all our coupon codes and deals and pick the one that fit your needs the best. On India’s 70th independence day, why not go ethnic with awesome discounts on traditional wear in the exclusive Independence Day sale at GrabOn. Embrace the spirit of ‘Bharatiya’ and give your ‘everything-ethnic’ avatar a chance. From handloom sarees to khadi kurtas, shimmering accessories and unique handcrafted wallets, get the best price on quality products to make your Independence Day a little more special than the last one. But don’t forget to save the money, honey! Avail our Independence Day deals by applying coupon and promo codes before making the payment. Don’t Be Rash, Save Your Cash! It feels great to have completed 70 years of Independence this year, a good long time. You don’t have a choice to take that long to finalize your deals! Make use of the limited period offers that’ll last just for a day or two. Don’t miss this enthralling online Independence Day sale this 2019on clothes, shoes, bags, fashion accessories and much more. All you need to do is just spend a few minutes to grab an exciting offer on trendy outfits and fancy shoes and bookmark it for the D-day. Flaunt your best at incredible prices; Who said shopping needs to be expensive?! Independence Day Flight Offers: Let The Colors Of Freedom Fly! What’s Independence Day without some sweets and kite flying competitions, right? This Independence Day, keep up with the ritual and fly to your friends and family without worrying about sky-high prices. So, hurry and grab the best flight deals with exciting cashback in 24 hours with exclusive Independence Day discounts. Be it rainy or sunny, celebrate this Independence Day with your loved ones. Don’t let the interior designer dictate the terms of how your home looks! Take matters in your own hand and design your home the independent way. Surprise your loved ones by redecorating your home, with fabulous furniture at best prices. Get amazing Independence Day coupons on home-decor, furnishings, kitchenware and a lot more. Change how your home looks on this day of freedom with a do-over. Looking For The Best Independence Day Offers This 2019? Make this 15th August 2019.a memorable one by availing these awesome Independence Day deals across fashion, travel & home décor, upto 80% off on your favorite bands. Browse through Amazon's Freedom Sale, Myntra' Right to Fashion Sale, Flipkart's Big Freedom Sale, Myntra’s Right To Fashion Sale, BigBasket's Independence Day Sale, Paytm's Freedom Cash Back Sale & so on! Get whopping deals and exciting discounts on a wide range of clothing, accessories, home decor, flight & travel bookings. Check out our coupon codes and deals and pick the one that fits your needs the best. This year, celebrate Independence Day with an ecstatic shopping experience. GrabOn is pleased to hand curate the best deals, sales, and offers for your shopping pleasure. Choose from top online sites like Amazon, Myntra, Jabong, Flipkart, Pepperfry, eBay, MakeMyTrip and more. Get the hottest deals with Independence Day promo codes on home décor and kitchenware at GrabOn. Your one-stop tab for the most appealing deals. Avoid the post-shopping guilt trip with great offers and deals when you go on a shopping spree. Shop smart, save more. Be independent! Choose from over 2500 brands and 20,000 deals across 200+ categories. Enjoy upto 40% OFF on mobiles and accessories from brands like Huawei, Honor, OnePlus, Nokia, Motorola and more. Upto 50% OFF on electronics from brands like Intel, Lenovo, Seagate, Canon, WD, Sennheiser and Bose with no cost EMI and exchange offer. Upto 70% OFF on Home and kitchen appliances and 50% on daily essentials from Amazon Pantry. Clothing and accessories at upto 80% OFF on brands like U.S. Polo Assn, Caprese, Redtape, United Colors of Benetton and more. Enjoy upto 40% OFF on TVs and large appliances from brands like Whirlpool, Sony. Pay through SBI Card to avail an extra 10% instant discount. Exclusive deals for Prime members, so subscribe now! Myntra Right to Fashion Sale offers flat 50%-80% discount on fashion apparels and accessories from top brands. Axis bank users can avail an extra 10% OFF and choose from top brands at a very low price. You have all the freedom to refresh your wardrobe with! Are you in need of a new mobile phone? Well, look no further, purchase brand new smartphones at amazing prices with the Independence Day mobile offers from Samsung (Upto 40% OFF), Xiaomi MI Mobiles (Upto 30% OFF), Oppo mobile phones (Upto 35% OFF), Apple iPhones (Upto 28% OFF) and Vivo (Upto 45% OFF) among others. Make use of the Flipkart Big Freedom Sale and get upto 80% Off on everything from on mobile phones, gadgets & electronics, fashion accessories, home appliances and more. Avail products for 30 minutes of ‘Price Drop’ from 7.47 PM to 8.18 PM. Apart from that, there are 24 amazing deals during the 24 hours along with Rush Hour deals available from 12 AM to 2 AM. Get an additional cashback of 10% while paying through Citi Bank credit cards. Celebrate Independence Day with BigBasket and get upto 40% OFF on all grocery and everyday supplies like face wash, hand Wash, deodorants, hair and skin care, beverages, ready to cook and eat foods, snacks and more. Big brands like Axe, Close Up, Comfort, Dove, Kissan, Lifebuoy, Lipton, Red Label, Surf Excel, TRESemme and more are on sale. Its all about freedom - freedom of speech and freedom of expression. But it is also about freedom from extra spending. Yes, this Independence day celebrate the freedom to save as much as you want. 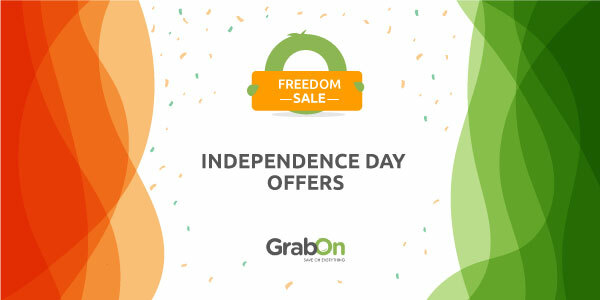 Because GrabOn is giving you all exclusive Freedom sale right here, right now. Shop for fashionable clothes and footwear, cool gadgets and electronics or anything you want and we will help you save on all of that and more. Get freedom from paying extra and learn to save with us because we will provide the best discount possible. It is Freedom to Save More day today.